The Northern Lights Will Be Visible Over the U.S. Tonight. Here's How to See the Display. Most of the places with a great view of the aurora borealis get pretty damn cold -- Alaska, Norway, Finland, Iceland. So, a chance to catch this bucket list item near home in the dead of summer is an opportunity you shouldn't pass up. You may be able to see the northern lights on the night of Monday, July 23 in parts of the northern United States. 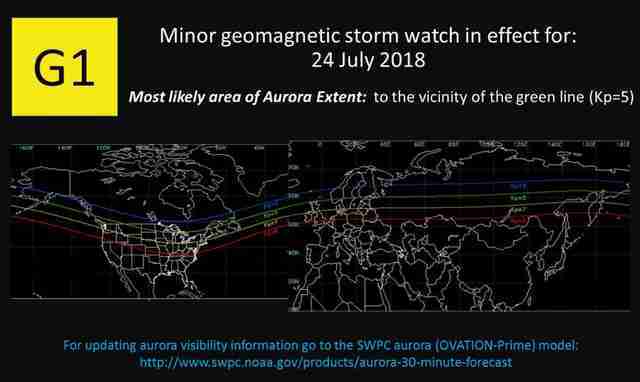 The colorful display will appear further south than usual due to a minor (G1) geomagnetic storm, reports NOAA's Space Weather Prediction Center (SWPC). The green line in the map above marks where you might catch the northern lights Monday night into Tuesday morning. In the US, the area includes parts of Montana, North Dakota, Minnesota, Wisconsin, Michigan, and Maine (that's in addition to Alaska, but the display isn't all that unusual there). In Canada, you'll be inside the aurora zone if you're in British Columbia, Alberta, Saskatchewan, Manitoba, and northern provinces, as well as most of Ontario and Quebec. While a G1 event is considered minor, it does supercharge the aurora to the extent that it can be seen further south than usual. The video above, taken over the Mackinac Bridge in Michigan, was filmed during a G1 event earlier this year. According to the SWPC's 3-Day Aurora Forecast, the best time to be out aurora hunting will be the night of July 23 from sunset to 1am. That's when you'll have your best chance of seeing the northern lights. The celestial display is best seen far from city lights. Get out of town toward dark skies. National parks and state parks are usually great places to start looking. An SWPC representative previously told Thrillist, "You need very clear skies, a good view of the northern horizon (no trees, buildings or hills), and it needs to be dark." It's an opportunity you shouldn't miss if you're in the right area. The solar cycle is currently near solar minimum, which means the opportunities to see the display this far south could be infrequent.